According to a new market report published by Transparency Market Research titled “Water Softening Systems Market– Global Industry Analysis, Size, Share, Growth, Trends, and Forecast, 2018 - 2026,” the global water softening systems market is expected to reach a value of US$ 7,537.6 Mn by 2026. In terms of value, the market is estimated to expand at a CAGR of 5.2% during the forecast period from 2018 to 2026. In terms of volume, the market stood at around 2,447.3 Thousand Units in 2017. The Asia Pacific water softening systems market is projected to have the highest growth due to rapidly developing industrial infrastructure, increasing awareness of advantages of using soft water in the residential and commercial sector, and increased government spending on water softening activities in developing nations such as India and China. The North America market witnessed highest growth due to increasing awareness of using soft water among the consumers as 85% of North American households live in hard water areas and also due to growing research and development activities leading to product innovations and technologically advanced products. Water softening systems are gaining popularity in North America and Europe because of its smart features such as Wi-Fi enabled water softening systems. Moreover, government initiatives in smart water treatment activities (as part of smart city projects) is anticipated to be a growth factor for the water softening systems market. However, one of the main challenges impacting the growth of the market is low penetration in rural areas which may prove to be a restraint in many developing countries in the short run. 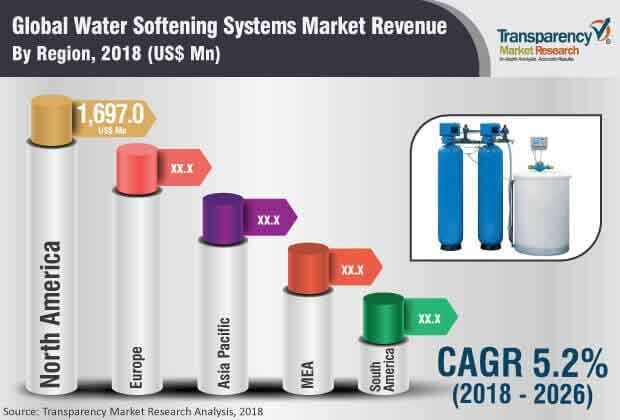 On the other hand, increasing demand for water softening systems in emerging economies and rising manufacturing activity across the globe are key opportunities for the growth of the water softening systems market. In 2017, based on type, salt-based ion exchange softener accounted for market value of US$ 3,411.5 Mn in the global water softening systems market. Salt-based ion exchange softener water softening system accounted for larger share because this system completely removes contaminated hard water minerals instead of conditioning it chemically. According to flow rate, 05 GPM to 30 GPM flow rate water softening systems accounted for major share of US$ 1,505.5 Mn in terms of value in 2017, as this segment of water softeners are mostly used in residential and commercial applications. Increasing demand for water softeners in the residential and commercial sector is boosting the use of 5 GPM to 30 GPM flow rate water softening systems. According to application, residential water softening systems were valued at US$ 1,710.4 Mn in 2017 since the consumption of water softening systems is more in the residential segment. Based on distribution channel, offline sales acquired the major market share in terms of value accounting for US$ 3,418.8 Mn in 2017. In terms of geography, North America accounted for the largest share accounting for US$ 1,646.2 Mn in 2017, followed by Europe. North America accounted for the largest share because the region is majorly affected by hard water, and it also sees increased research and development spending by manufacturers. Some of the key players profiled in the global water softening systems market are A.O. Smith Water Technologies, BWT Aktiengesellschaft, Culligan International Company, EcoWater Systems LLC, Pentair Residential Filtration LLC, Feedwater Limited, Fleck Systems, Harvey Water Softeners Ltd, Kinetico Incorporated, Marlo Incorporated, Monarch Water Ltd., Pelican Water Systems, Qingdao Haier Co., Ltd., Watts Water Technologies Inc., Evoqua Water Technologies, and Whirlpool Corporation..